My memory of “The Serial Garden,” a short story I read when I was ten or eleven years old, is foggy, but the plot revolves around a boy who assembles a paper model garden from the back of a tasteless cereal called Brekkfast Brikks. After discovering that singing the Brekkfast Brikks ode written on the box allows him to enter the garden, the boy begins to withdraw more and more into the partially real, partially fabricated landscape that he has constructed both physically and, possibly, mentally. Inside of the model garden, large portions of the idyllic flora and fauna fade into a dreamy fog where the neighboring models have not yet been attached. Until the adjacent models are linked, the garden exists as an unfinished world. August Moonlight. Oil on linen. 2015. 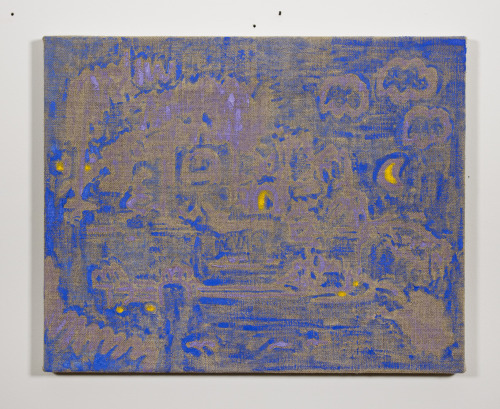 I was reminded of “The Serial Garden” for the first time in many years, while viewing the simultaneous flatness and hazy depth of the mostly blue and lilac August Moonlight, one of ten paintings by Ryan Nord Kitchen recently on view in “Summer Paintings” at Terrault Contemporary. The reliance on signifiers of the landscape (moon, tree, cloud) hinders August Moonlight from falling into total abstraction, but the ample use of blue and exposed linen accentuate the painting’s surface. Loose outlines of clouds and bushes in the foreground trail off into a collapsed, blurry backdrop in the center, drawing on traditional elements of perspective to create a deep space while concurrently acting as a wall, obstructing the landscape behind. The distortion of the dryly applied brush marks does somehow translate into a muggy and heat-shimmered atmosphere, and there is something inherently magical about a garden bathed in blue when the familiar urban landscape so frequently glows a noxious orange. The palette for most of Kitchen’s paintings relies on one dominant color straight from the tube, interspersed with other primaries. 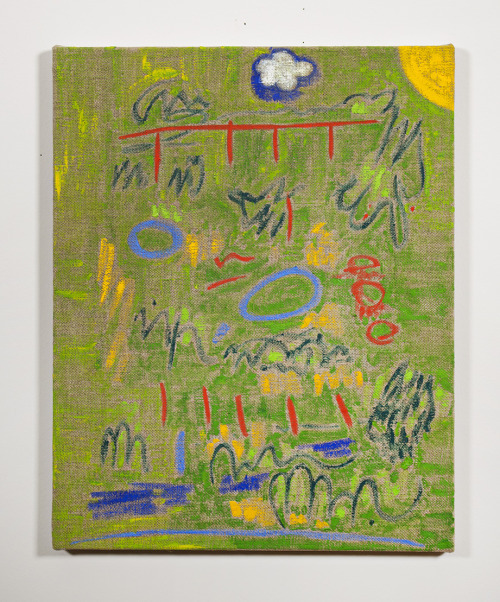 The childlike color and mark making is most effective in works like Ponds 2, a field of green speckled with an archetypal corner sun, a puffy cloud with a perfect drop shadow, and a series of red tick marks making up a bridge or jungle gym. The pure yellow of Summer Painting, too, functions as a warm ground for a landscape of bushes and clouds, emanating heat and feelings of mirage and distortion. In some cases, the deliberate wiggle of a line even closely resembles a word, almost spelling out “wind” or “pond,” but ultimately these lines dissolve into indecipherable loops. Ponds 2. Oil on linen. 2015. Some of Kitchen’s compositions seem to borrow elements from Chinese shan shui (aptly, “mountain water”) scroll painting, stacking mountains and skies and suns from multiple points of view, especially in the more graceful linework of Garden and Fountain. Fittingly, many of these Chinese landscapes, primarily from the Tang, Song, and Yuan dynasties, depict nature as a place of retreat or sanctuary in times of political instability. Perhaps Kitchen’s paintings do the same, relying on the garden as a space for escape and blissful daydreaming amidst a grim political climate. 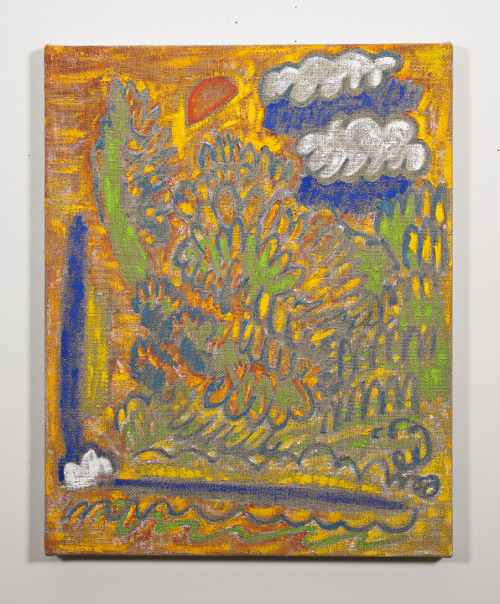 The only accompanying text for the show, “Some are cloudy days and others are sunny days,” mimics the childlike mark making of these paintings. What does it mean to equate the unending atrocities of recent current events (a texas grand jury declined to indict anyone in the death of sandra bland, boko haram, now ranked as the world’s deadliest terror group, continues terrorizing nigeria, recent mass attacks by isis in beirut and paris) with cloudy days? The depicted gardens here provide, as so many before have in the canon of landscape painting, a temporary retreat to a saturated wonderland that feels very pleasant, if slightly naive. Summer Painting. Oil on linen. 2015. Even after all of the Brekkfast Brikks models have been assembled in “The Serial Garden” to form a complete garden, the boy returns home one afternoon only to find that in the midst of spring cleaning, his mother has burned the paper model in the furnace. There is no trace of any other Brekkfast Brikks boxes or means of returning to the utopian garden again. Maybe it is a reminder that these moments of escape can only be short-lived. Kitchen’s depictions of perfect, summer days likewise can only momentarily provide a distraction, but for that moment, they do emanate a certain tangible warmth.